Advertiser.ie - Keane has the hunger, but does Fianna Fáil have the appetite? When was the last time Fianna Fáil won two seats in Galway West? The 2007 General Election - now more than a decade ago. Older party activists will sigh with nostalgia for the days when FF could take three out of five. The last time that happened was in November 1982 - 36 years ago. With this in mind, it is interesting to note that discernible trend in recent opinion polls showing a swing away from Independents, back towards parties, with Fine Gael and Fianna Fáil, as the largest parties, naturally the main beneficiaries. The most recent poll was The Irish Times-Ipsos MRBI opinion poll, published last week, showing Fine Gael at 31 per cent (down three ) and Fianna Fáil at 26 (up one ). When compared to polls in January and March, the general level of support for the 'Big Two' has remained between 57 and 59 per cent of the overall vote. Although, while commanding, this is merely recovering ground to above 2011 levels (53 per cent ), but still some way off the 68.9 per cent of 2002, the 67.2 per cent of 1997, and well below the +70 per cent figures of the 1980s. However much wishful thinking right-wing and conservative commentators indulge in, FF and FG will never again command the same levels of support they once did. The 'floating voter' is now a larger and more influential category than ever; Sinn Féin has grown steadily to become the third largest party in the State (22 per cent in the latest Irish Times poll ); and, while Independent support is in decline now (16 per cent, down two ), Independents will remain a factor of Irish political life (the post-independence elections of 1922, 1923, and 1927, a far more politically unstable time, saw nine, 13, and 16 Independents elected respectively ), meaning their support will ebb and flow, but never disappear. If the current poll figures for FF and FG were replicated in the next general election in Galway West (quota 16.67 per cent ) the two parties would be guaranteed three seats, given a quota for three in a five seater is 50 per cent. However, to win four seats (two apiece ) demands 66.68 per cent, and both parties are well off achieving that. Indeed FF and FG combined have only ever returned three TDs since 1987, the sole exception was November 1982, when FF took three and Fine Gael two ). Local polling also confirms this. A poll undertaken by Fianna Fáil in late January/early February shows the five Galway West incumbents - Fine Gael's Seán Kyne and Hildegarde Naughton, Fianna Fáil's Éamon Ó Cuív, and Independents Catherine Connolly and Noel Grealish - are on course to retain their seats, with Social Democrat Niall Ó Tuathail hovering in sixth place. An interesting, yet throughly unsurprising, finding is that while Dep Ó Cúív is on course to top the poll at the next election, he will not bring in a running mate. 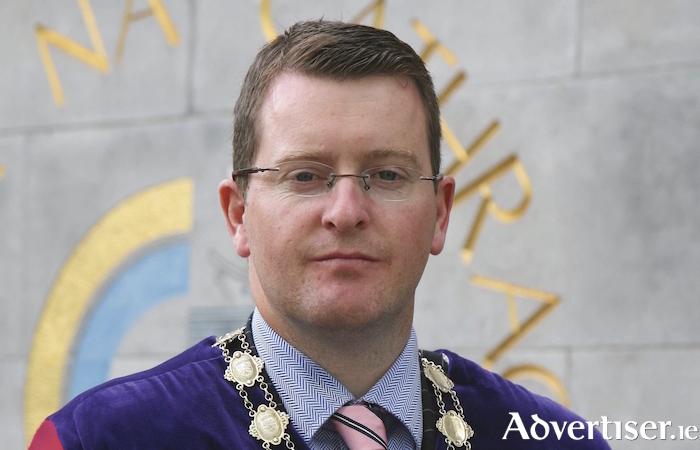 That running mate is almost certain to be city councillor Peter Keane, who has been beating the streets, canvassing areas outside his council constituency of Galway City West, hosting public meetings, and generally raising his profile to its highest levels since he stepped into politics in 2009. However it is an old truism in politics that a candidate's greatest opponents are not the other parties, but his/her own running mates - and it seems Cllr Keane is set to have to learn this lesson. Few would disagree that FG's Kyne and Naughton will be returned at the next general election, while Independent Catherine Connolly is looking good to hold on to her seat. Therefore, the only way Cllr Keane can challenge for that second seat for Fianna Fáil is by achieving three things. The first is targeting Noel Grealish. That internal FF opinion poll noted that Dep Grealish would take the last seat - a significant drop from his 2016 placing of taking the second seat. This means his vote share - a consequence of a fall in support for Independents - is down, and therefore he is vulnerable. Also, Dep Grealish's vote tends to come from the FF ‘gene pool’, so a strong run in the Oranmore area by a second FF candidate could unnerve him. Second, Cllr Keane needs to stay ahead of the Soc Dem's Niall Ó Tuathail. If the FF poll is right, The Purple One could be in the mix for the final seat, especially since Labour is still out for the count, and provided the impressive energy and vibrancy of the Soc Dem's volunteers can be maintained. What will worry FF is that the Soc Dems are as interested in courting soft and wavering FF voters as they are lapsed and disillusioned Labour voters. The third challenge is of Sisyphean proportions. To have any chance of winning two seats, FF needs to operate a disciplined voting pact among its candidates - something at which the party is notoriously bad. In the 2016 election, the combined FF Galway West vote was 24.2 per cent, edging it ahead of FG on 24 per cent, and making FF the largest party in the constituency by vote share. Yet it was the Blueshirts who took two seats, while FF only took one. This is because FG's candidates ran a disciplined vote strategy which saw Kyne take 9.5 per cent, with Naughton and John O'Mahony scoring seven per cent each. The latter's transfers saw Dep Naughton home. By contrast, Dep Ó Cuív took a mammoth 14.8 per cent of FF support leaving running mates, John Connolly and Mary Hoade, to feast on the crumbs of six per cent and 3.4 per cent respectively. This left them with vote tallies which were too low from which to be able to challenge for the final seat. A further complication for FF is that Dep Ó Cúiv gets a substantial vote in the city, thereby robbing any city based running mate of vital foundations. Dep Ó Cúiv has the safest seat in the State, and even if FF were annihilated, he would still be returned. The problem is, as a leading figure within the party, and a large vote getter, he is something of an 'over-mighty chieftain', sucking up too many of party's votes and leaving little for anyone else on the FF ticket. The lean and hungry Cllr Keane has not been shy about displaying his appetite for getting on the ticket. Yet, despite much dismay from Galway party grassroots after the 'auld enemy' took two seats on a lower vote in 2016, there appears to be little hunger within FF to order the Cornamona man to scale back operations, and give Cllr Keane the chance to secure a voting tally that will put him in the mix with Grealish and Ó Tuathail for the final seat. It is important to remember that polls are a snapshot in time, and that much can change between now and whenever the next general election is called, but whatever happens, the questions for Fianna Fáil - Is the party willing to learn from FG's 2016 experience? Can it convince its most powerful vote getter to 'share the spoils'? Does it have the discipline to implement such a system? - remain and will have to be answered.